Backyard composting doesn’t have to be difficult. It’s just a matter of getting into the habit of handling kitchen and garden organic waste a bit differently. When I was growing up, we had a compost pile and we kids took turns taking kitchen peelings out to it. Perhaps that’s why I find composting to be the most natural thing in the world. I feel guilty if I throw even a lemon twist into the garbage, so it surprises me that every gardener doesn’t compost. 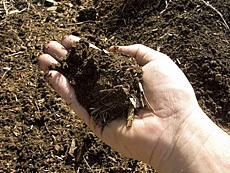 Compost – or humus (the term for broken down organic material) – is the best treat you can give your soil and plants. As well as enriching the soil and improving its texture, scientists have even discovered that compost, as well as feeding plants, helps protect them from pests and diseases. It’s also good for the environment, as backyard composting takes the pressure off municipal garbage disposal. Compostable materials make up 20 to 30 percent of household waste. So when you compost: everybody wins. Your garden soil and plants get a natural treat, and you save money on fertilizer, and your municipality saves money because it has less organic waste to deal with. Composting works best when you combine an equal balance of materials containing carbon – often (but not always) brown in color, such as autumn leaves, straw or shredded newspaper – and materials containing nitrogen – generally green, such as kitchen scraps and grass clippings. Turn the material occasionally with a pitchfork or garden spade to help speed decomposition. 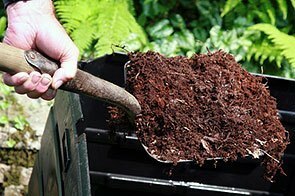 If you live in an urban area, it’s best to use a good quality compost bin. When I had a small city garden, we worked out a two-bin method for our composting needs. Having only one bin made it difficult to get finished material out of the bottom while continuing to add to the top. With two bins, we could fill one over the summer and then turn that partially composted material into the second bin along with shredded leaves in the fall. Over the winter, we would refill the empty bin. By spring, we had finished compost for the garden from the previous season’s organic matter, which we used when planting or for mulching around plants. Then we would turn the winter’s material and that spring’s yard waste into the empty bin, where it would “cook” through the summer and be usable by late fall. This two-bin composting method yielded enough humus for a small garden. When we started, the soil was heavy, unworkable clay, but by the time we moved six years later, it was perfect loam.